Swedish Massage - Uses a combination of long strokes, deep kneading and vibration, with joint management. 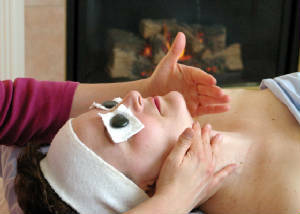 Deep Tissue Massage - A combination of various techniques adjusted to the client's tolerance. Trigger Point Release - Firm pressure applied over the trigger point that helps to alleviate pain in various muscle groups. Myofascial Release - A gentle technique that addresses the fascia in the body which helps decrease restrictions thereby improving mobility. Stretching - A gentle technique to increase range of motion. Prenatal Massage - Massage during pregnancy. Physician approval is recommended. Infant Massage - Teaches parents techniques that will help soothe their baby. Reflexology - Based on the principle that certain areas on the hands and feet correspond to each organ and structure in the body. Strain-Counterstrain Techniques - Technique that will shorten the muscle in an attempt to break the pain spasm-pain cycle. Manual Lymphatic Drainage - Stimulates the circulation of lymph through the Lymphatic System using light, rhythmic techniques. Raindrop Technique - A powerful technique using essential oils and combining holistic techniques such as aromatherapy, Vitaflex techniques, and Feather Stroking to create a synergisitc effect for the body. Aromatherapy: The use of Essential Oils to promote physical and psychological well-being as part of a holistic treatment approach.